Pink Bob (busy bunny) - Help mummy - tidy toys, clear table, care for books, tidy bedroom, help others. Orange Bob (road safety) - Know Tufty and friends, Green Cross Code, have a knowledge of road sense around own area. 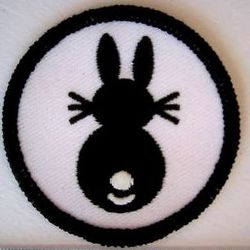 They didn't have to make a Promise, but did have to memorise their name, address and date of birth, know the Bunny vesper and song, and remember to wear uniform. Though they were well known within Northern Ireland, in the rest of the UK most Guiders were not aware of them at all. They were only officially recognised by the UK association in 1985. 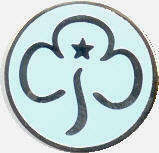 At that time, in the rest of the UK, under 7's were not admitted to Guiding. There were two reasons generally given - that getting insurance cover for the younger girls would be very difficult and costly, and that girls who were so young wouldn't be able to really understand the meaning of a promise and what they were committing themselves to in making one. But they started pilots in a number of parts of the UK. The pilot groups had no structure or uniform set, so had to develop for themselves. Several of the groups independently chose some sort of tabard to wear as uniform, as many of the children attended the groups straight from school and wouldn't have time to change their clothes, the tabards were often in colours related to the theme the group had chosen to follow, such as brown for owlets, yellow for sunbeams, red for robins or green for foresters. At the end of the pilot, it was agreed that the scheme was a success and Guiding could be rolled out to the younger age group - but with so much diversity of uniform and name amongst the pilot groups, what name and programme to choose? Finally, in 1987 a decision was made, and Guiding launched a brand new section which tried to solve the arguments over names and colours - Rainbows! It was open to 5-7 year olds (although Northern Ireland were allowed to continue admitting 4-year-olds, and they still do). For uniform, they wore tabards over their day clothes, and had a triangular cloth promise badge with a picture of a rainbow on it which was sewn centrally against the neckline. Initially the tabard colours available were red, green, blue and yellow, later orange and purple tabards became available. Information on what should be in the programme wasn't plentiful, so it was left entirely up to each unit to invent their own opening and closing ceremonies, their own programme, customs and traditions, and to choose their own leader names too. Soon other colour s of tabards became available - red, orange, yellow, green, blue and purple (each unit choosing which colour to have, with everyone in the unit having the same colour). In time a green baseball cap, t-shirt and shorts were produced too - these were all optional, and thus rarely seen, most girls sticking with the original option of putting their uniform tabard on over whatever clothes they were already wearing that day. Rainbow Rabbit was introduced, to help the Rainbows with remembering to keep their Promise, and the soft-toy version with her felt tabard was adopted as a mascot by many units. 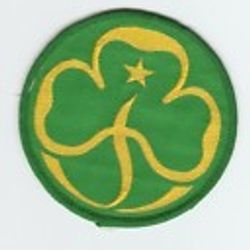 A new Promise Badge was introduced, in green - in order that the Rainbow Promise badge would now be in the same format as for the other sections, but it was produced in cloth only, as it was felt that pin badges weren't safe for Rainbow-age girls. (Metal versions of these Rainbow Promise badges were produced as part of a 'souvernir set' of badges mounted on a display card, but they were never issued as Promise Badges, which can cause confusion!). 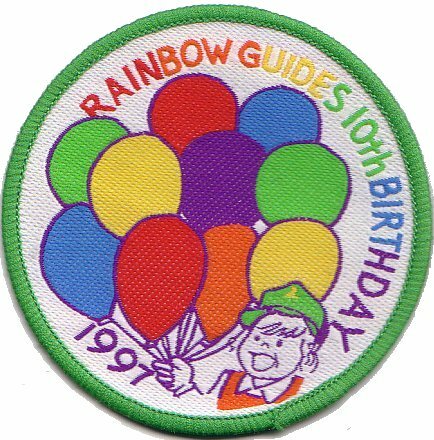 Having the same style of badge as the other sections was popular, but there was disappointment that that badge did not actually feature a Rainbow, or anything which seemed to represent rainbows - so an arch-shaped badge in Rainbow colours was produced to sew above the Promise badge. The Rainbow section celebrated it's 10th Birthday in 1997 with 'Rainbow Riots' being held in many parts of the country. Then a more formalised programme was brought in. 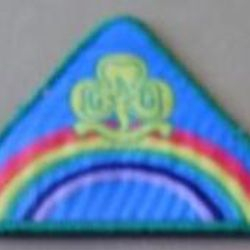 Roundabouts were introduced with generic Roundabout badges, the 'pot of gold' for those going 'over the Rainbow to Brownies', and Olivia, a mascot to guide Rainbows through their Rainbow career. Where before each unit had had to write their own opening and closing songs, a nationwide Rainbow Song was introduced, and Rainbows were encouraged to 'look, learn, laugh and love'. Rainbow uniform changed too - a polo shirt, jacket and trousers were brought in, in scarlet and grey-blue - and tabards became rarer, and only available in red or purple, though some units do still opt to wear them. Rainbows celebrated their 21st birthday in 2008 with all sorts of 'coming of age' events, including a special sunflower growing challenge, and during Guiding's centenary, Rainbows were involved in lots of activities, including special zoo visits, an d their 'Princess Parties' in various special venues where they got to dress up and enjoy all sorts of regal activities. 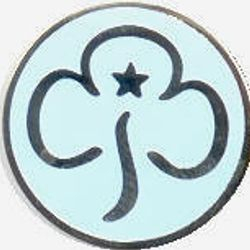 With the new uniform, a new Promise badge was introduced, in metal, with a pale blue background to match the uniform tops - initially with the older trefoil logo (which are comparatively rare) and soon with the current trefoil design. 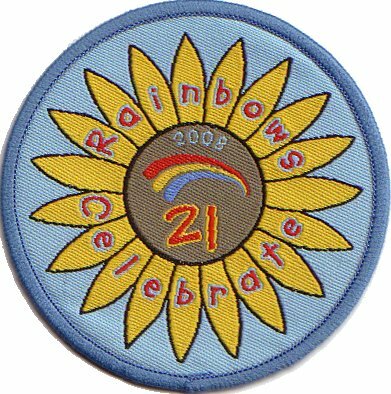 Rainbows were encouraged to sew any badges they gain onto the polo shirt or tabard above the hem - some gain enough to cover the whole of the front! 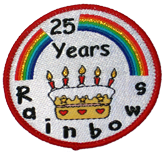 In 2012 Rainbows celebrated their 25th Birthday, they had a special anniversary badge, designed by a Rainbow, and all sorts of special events were organised including parties, outings, gatherings and sleepovers. A special new Roundabout was introduced too, to mark the special birthday. In 2013 new Roundabout badges were introduced, so instead of the Generic Roundabout badges which were the same apart from the coloured edges, specific badges were introduced for each Roundabout. In 2017 Rainbows celebrated their 30th Birthday with a range of local events. Countries and regions each created their own challenges and celebration events, such as Scotland's Mermaid challenge. In July 2018 a new Rainbow programme was launched, with a 1-year transition period. It sees Roundabouts replaced by a programme which runs through all the Guiding sections. It has six themes - Know Myself, Express Myself, Be Well, Have Adventures, Take Action, and Skills For My Future. 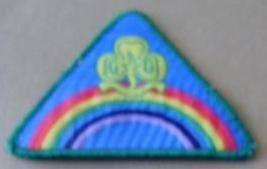 Rainbows on Skills Builders and Unit Meeting Activities - and at last, they have Interest Badges too. And there is also a high award to work for - Rainbow Gold Award.